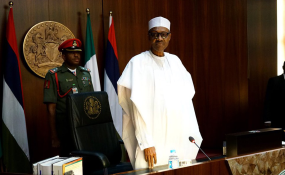 President Muhammadu Buhari yesterday told the Federal Executive Council why he cancelled his trip to Kigali, Rwanda, for the signing of the agreement framework for the African Union Continental Free Trade Area. encourage the dumping of finished goods in Nigeria. The president also stated that Nigeria was yet to fully understand the eonomic and security implications of the agreement. He, therefore, constituted a committee comprising the Ministers of Finance, Budget, Labour, Foreign Affairs, Science and Technology as well as the Central Bank of Nigeria, the Nigerian Customs Service and the Nigerian Immigration Service to review the content of the AfCFTA proposals and look at its security implications. The committee is to report to the council in two weeks. Addressing State House reporters after the council meeting, presidential spokesman Mr Femi Adesina said "The explanation from the President which the FEC bought was that he would not want to agree to anything that would hinder local entrepreneurs. And on the surface, except if proven wrong, is that that agreement has the capacity to affect local entrepreneurship. "Then he (Buhari) also said that anything that could encourage the dumping of finished goods in Nigeria was going to be contrary to our interest. So, it is one of the reasons while he declined. Then he said the country is yet to fully understand the Economic and security implications of the agreement." "So, there has to be further consultations with different stakeholders and the final position was that a committee be set up to meet and review the contents of that proposal and they will do it within two weeks and get back to the Federal Executive Council." "The committee which has two weeks to submit its report will be expected to look at the security implications of the agreement." Last week, the FEC had last at a meeting chaired by Vice President Yemi Osinbajo had resolved that Buhari should sign the AfCFTA agreement framework. The president, however, canceled his scheduled trip on Sunday after some of his advance team members had arrived Kigali.